To effectively launch your change initiative, consider the topics in this checklist. Check those topics that you will use to plan your launch strategy and work. Depending on the complexity and status of your initiative, you may need to take all or just some of these actions. If you are beyond the launch stage, review this list for actions that may still provide benefit to the smooth change leadership of your initiative. So many of the challenges we face in leading change are born in the Upstream Stage, which is when leaders need to be making key decisions to launch their major change initiatives successfully. Typically, leaders are so rushed to get the right solution to their problem that they blindly delegate project launch without providing adequate guidance. This webinar explores how to launch change effectively. This tool provides you with an extensive list of optional questions for your briefing interviews. Identifying your Project Briefing QuestionsThe questions cover the background and history of the effort, its current status, and its future plans as known today. The best briefing interviews ask for the most focused and leveraged information. The process of envisioning is as important as the vision you create. Conscious Change Leadership teams typically decide to involve a significant part – or even all – of the organization in the visioning process. Download this tool for suggested approaches, techniques, and tips for building your vision. Use the included worksheet to discuss and agree on each component of your visioning process as shaped for your project. Enter your conclusions and strategies in the appropriate spaces. Conditions for success are requirements essential to the achievement of your desired outcome, such as adequate resources, sufficient time to do a top-notch job, or quality communications that keep everyone engaged. Conditions for success may also refer to a particular state of being that enables the transformation to occur more smoothly, such as the leaders taking a conscious approach, the executives presenting a unified front in support of the transformation, and people realizing that their needs are actually being considered as the transformation is planned and implemented. 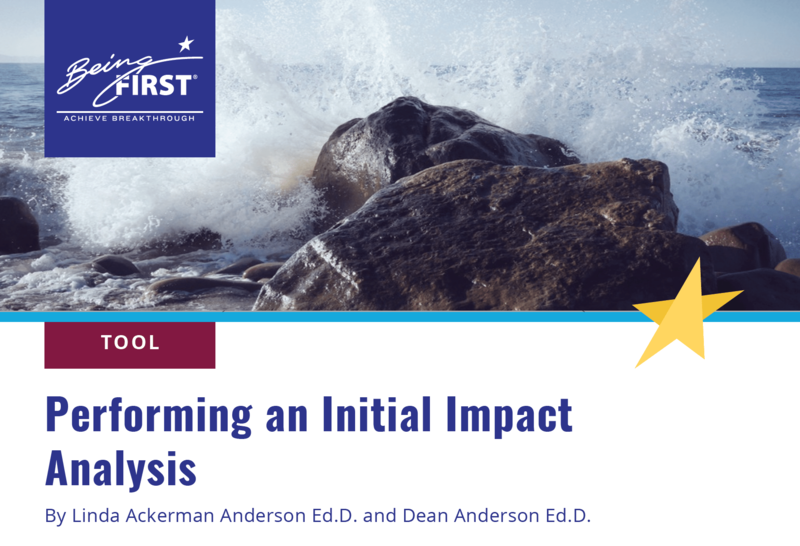 The Initial Impact Analysis Tool is a simple and powerful tool to use at the launch of a change initiative to prepare you to understand the full scope of your change initiative. Given the assumption that change is continuous, and your intention is to strengthen your organization's ongoing capacity to lead large-scale change, this Info Sheet lists the different factors to consider in order for you to learn from your change process and establish best practices. Your chances of succeeding in your current organizational change efforts are directly affected by your people's level of readiness and capacity to change. This Info Sheet provides a comprehensive list of dynamics that influence both readiness and capacity. Many leaders never address these topics in preparation for a major change effort. Some resist delving into such matters. However, inquiring into these subjects will likely surface information that, although it may be uncomfortable for the leaders to acknowledge, is key to aligning their change strategy with the true condition of the organization. At the very least, raising these topics will start many conversations among leaders and employees that would never otherwise have occurred, all in the name of building awareness for leading conscious transformation.